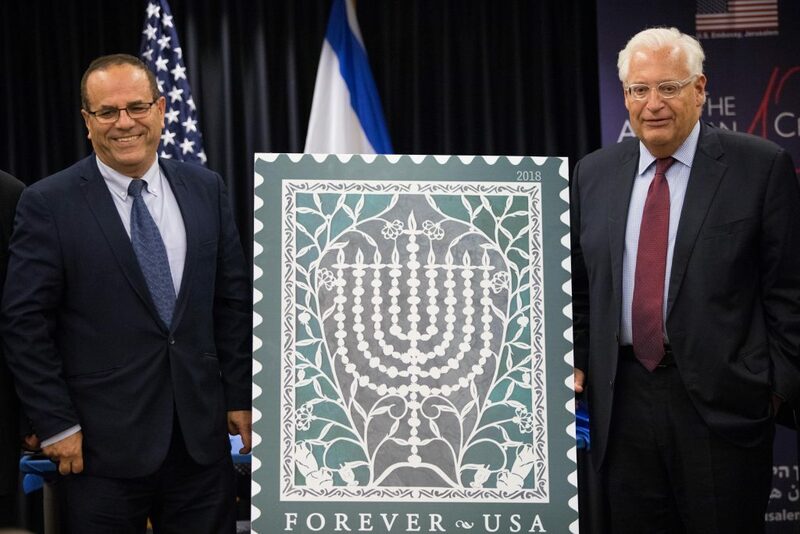 A joint U.S.-Israel postage stamp for Chanukah commemorating 70 years of diplomatic ties between the two countries was unveiled at simultaneous ceremonies in Yerushalayim and at the Touro Synagogue in Newport, Rhode Island on Tuesday. “Today’s joint stamp issue is a symbol of the shared values and the cultural affinity between the United States and Israel,” U.S. Ambassador David Friedman said at the ceremony in Yerushalayim. The new stamp artwork displays a menorah in the style of the traditional Jewish folk art of papercutting. Artist Tamar Fishman created the original art for the stamp by making a pencil sketch of the design and then, with a fine blade, cut the two-dimensional image on white paper. Ethel Kessler was the stamp designer. The blue-purple and green stamp is also adorned with ancient oil jugs and dreidels. The stamp is available for purchase at IPC branches in Israel and sells for NIS 8.30. The USPS Forever stamp currently is priced at 50 cents, but the Postal Service is seeking to raise it to 55 cents in January. The first joint Chanukah stamp was issued in October 1996. It was the first Israeli self-adhesive stamp.